What do cholesterol and exercise have to do with each other? Lots! You need a low level of cholesterol to be healthy, but through poor diet and a sedentary lifestyle many people get high levels of bad cholesterol - very unhealthy. Cholesterol (C27H46O) is a waxy steroid found in cell membranes. It is necessary for healthy cells in animals, but it's not all good as you probably know. High-density lipoprotein (HDL) is a lipoprotein that carries 'good' cholesterol around your body. Thus, it is simply referred to many times as just 'HLD cholesterol'. Low-density lipoprotein (LDL) is a lipoprotein that carries 'bad' cholesterol throughout your body. High levels of it have been correlated with heart disease and other ailments. Thus, it is commonly referred to as 'bad' cholesterol. HIgh levels of good (HDL) cholesterol and low levels of bad (LDL) cholesterol is the name of the game. How Do Cholesterol and Exercise Work? Lucky for you, cholesterol and exercise go together: exercise raises levels of good cholesterol and lowers levels of bad cholesterol. Just what the doctor ordered. 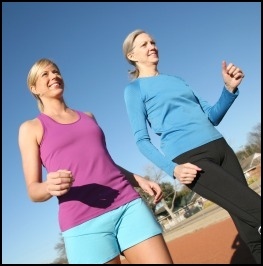 Daily exercise is the preferred way to lower your cholesterol. It's simple to do, cheap, and there's almost no risk of collateral damage - as ther might be with some pills. And if the exercise results in weight loss, there's an even more dramatic fall in LDL (bad) cholesterol levels! Less fat means less bad cholesterol mucking up your body. There's more! Mixing exercise with improvements in your diet will bring even more improvements. With all of these, just through some simple lifestyle changes you can radically improve your cholesterol levels. Also, an interesting fact is that the amount of exercise done has more effect on your cholesterol levels than the intensity of that exercise. You can get more benefit by walking and jogging more than by sprints or more brutal (but short) exercises! Just exercising 3 days a week, 30 minutes per day, has been shown to reduce bad cholesterol levels. This is useful and certainly doable, though you'll get your greatest benefits from daily exercise. In the beginning, walking is a good place to start if you haven't been active for a while. Set aside a little time, 15 - 20 minutes 3 days a week in the beginning, and go walking at your local park, around the block, or wherever. Integrate exercise into your life. It's old advice, but taking the stairs and not the elevator, doing activities with your friends, etc. will help you be more active. Every little bit helps. In 1996, the Surgeon General recommended burning 150 calories a day through exercise to be healthy. That's the equivalent of walking about 1.5 miles a day, and an excellent level to keep your health. If you're in better shape, or walking isn't your style, find some fun ways to exercise. There's tons of stuff out there, and you can find something you enjoy. Also, at least one study has shown that weight training can help you lower your levels of bad cholesterol. So, that might be your cup of bitter, iron tea. Just to be responsible about this, if you haven't done any exercise in a long while you should talk to your doctor before starting. It might not be convenient, but it could keep you from doing unacceptable damage to your body. • Click here to learn more about the Benefits of Physical Fitness & Exercise! • Click here to leave 'Cholesterol and Exercise to Get Healthy' & go back to the Complete Strength Training Home-page! 1. Ornish, Dean, and Art Smith. 2007. The Spectrum: A Scientifically Proven Program to Feel Better, Live Longer, Lose Weight, And Gain Health. New York: Ballantine Books. Pp. 162. 2. McGowan, Mary P., and Jo McGowan Chopra. 2002. 50 Ways To Lower Your Cholesterol. Chicago, Ill: Contemporary Books. Pp. 75. 5. Prevention Health Books. 2008. Cholesterol Cures: Featuring The Breakthrough Menu Plan To Slash Cholesterol. New York: Rodale. Pp. 60. 9. Freeman, Mason W., and Christine E. Junge. 2005. The Harvard Medical School Guide to Lowering Your Cholesterol. New York: McGraw-Hill. Pp. 138. 10. Prevention Health Books. Pp. 60.